When Matt Pond’s brain tumor returned in 2007, his doctors in Idaho told him there was nothing more they could do for him. Matt’s family searched the country for any other treatment options. Matt’s brother found Randy Jensen, MD, at Huntsman Cancer Institute (HCI). Dr. Jensen asked Matt to fly down to Salt Lake City right away to see him. The doctors at HCI decided surgery was an option for Matt. They asked, “Can we do one more surgery? And then will you come see us every once in a while for the next 30 years?” Matt remembers he started to cry, then laughed and asked if they could make it 50 years. A week later, Matt had life-saving surgery at HCI. But when he came out of surgery, his right side was paralyzed. At the University of Utah’s Rehabilitation Center, Matt relearned how to walk and speak. He learned to read and write again—this time with his left hand instead of his dominant right. 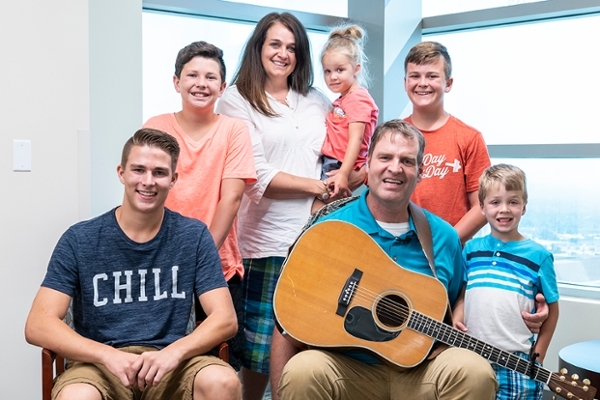 Matt taught himself to play guitar with one hand while he was getting chemotherapy in Rexburg, Idaho, after surgery. “I had a captive audience in the infusion room,” he jokes. His care team at HCI worked hand-in-hand with his doctors in Rexburg to provide excellent care close to home. Eleven years later, Matt is cancer-free. Today, the father of five shares his story and music with hopes of inspiring others to remain strong through their own challenges.